So I think we are keeping braids for a while. It really works as braids are so easy to manage. She wore the last set for a whole month!! Her ends were so thin, especially in the front, that I had to trim her hair and it looks so much better now. After co-washing her hair, it was dried by stretching it with the threading method. I prefer braiding on stretched hair as this method reduces tangles and shrinkage. I used Oyin Burnt Sugar Pomade to braid her hair. I decided to cut the braids bigger this time around because well, it is easier that way :). I wet her braids with water and aloe vera juice, and then applied a leave in conditioner (Shea Moisture Restorative, I was out of Knot Today). By the way, in my opinion, KNOT TODAY is way better than Shea Moisture Restorative conditioner for wet styles. I sealed her ends with coconut oil. Being that the braids are bigger, it was a bit challenging to get her ends curled up, so I applied conditioner and a little bit of Curl's Goddess curls gel to her braids individually. It is sort of like the wash and go method. I wet her hair everyday and seal with coconut oil. Her braids will be co-washed every week and the steps above will be repeated. 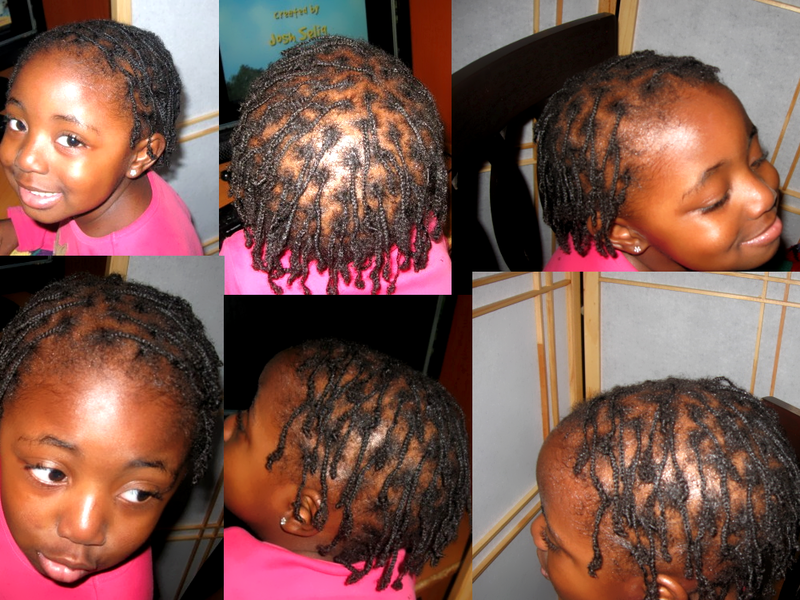 The braids allow me to easily massage her scalp and they last for a while. Being that they are bigger, we might keep this set for only two weeks. Thanks Vee. She has the cutest facial expressions.